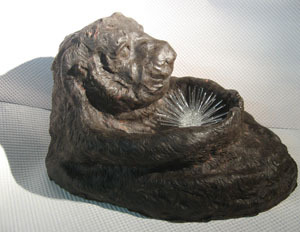 The kiln cast sculpture is three dimensional work that began with a Pacific Green Sea Turtle Bust. 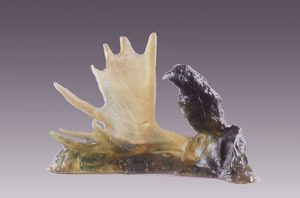 This piece was a stepping stone to a body of sculpture that has included, ravens, a moose antler with raven, and tortoise. It now includes my Cycle or Life environmental art education sea turtle sculpture project that is in progress. New raven sculptures are in the works. My wax sea otter awaits an investor for his trip to be cast into 100 pounds plus of cast glass. 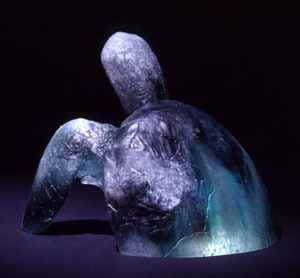 There will be a life size cast glass rhino done in cast glass block puzzle type sections. Maybe two. A mom and a baby. The rhinos an educational conservation project. 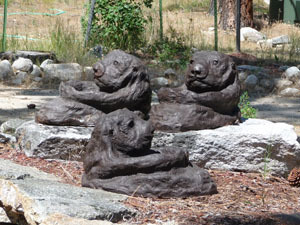 Each sculpture is one of a kind or a small limited edition. 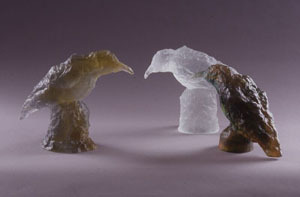 I specialize in kiln formed glass creating realistic animal vitreous paintings and kiln cast glass sculpture. My first love has been to create large cast glass pieces and for 36 years I have been working towards the goal of doing a life-size cast glass sea turtle. Along the way I became intrigued with sea otters. From Monterey Bay to the inland waters around Sitka, Alaska, I have photographed their play. With the sea otters being a threatened or endangered species, pending their locations, this brings the issue closer to my heart. As a stepping stone to doing my cast glass sea turtle and with my growing interest in sea otters I have recently completed a wax of a sea otter. I am looking for a person, organization or corporation to fund the casting of this first sea otter. Because of the technical aspects of this piece it will be a one of a kind or a very limited edition of two or three. My sea otter will also have a lamp worked glass sea urchin on his belly. I have subcontracted Deb Crowley of South Beach, Oregon to make the urchin for me. The reference for my sea otter sculpture is from my photographs taken from the ocean bay located west of Monterey Aquarium. Including Ray Ahlgren’s casting of the piece, Deb Crowley’s subcontract, miscellaneous parts and the time and material investment I have in the piece to date, it will take $23,700 to create this piece. That is the wholesale price. 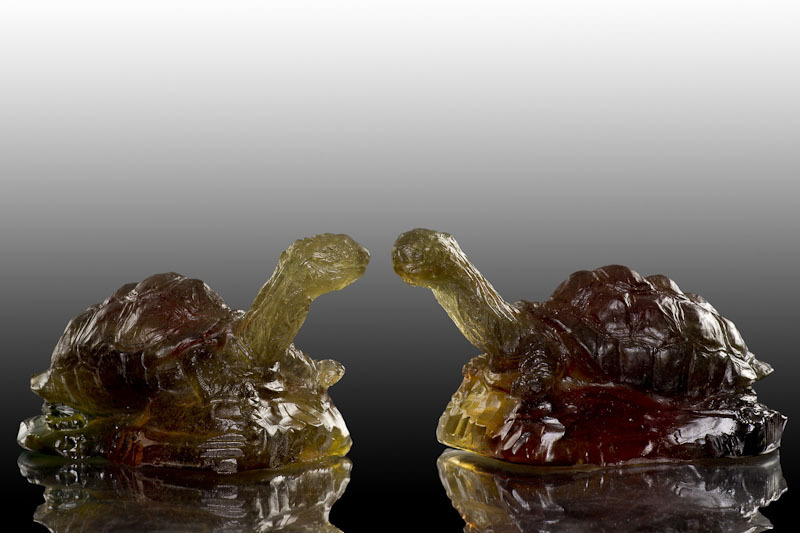 For the investor(s) of the launching of this fine art cast glass sculpture that is the price they would pay to own this work. I would ask for full publishing rights and to enter the sculpture in at least one exhibition for public viewing. contact Kathleen via this website. Size 10″ x 6″ x 5″. Weight 5 lbs. April 2010. Ravens are an unlimited edition.